Staples makes it easy to make more happen with more products and more ways to shop. Through its world-class retail, online and delivery capabilities, Staples lets customers shop however and whenever they want, whether it’s in store, online or on mobile devices. Staples offers more products than ever, in categories such as technology, facilities and breakroom, furniture, safety, and medical, as well as Copy & Print and Staples® EasyTechsm services. Staples has been making it easy for businesses for 27 years with thousands of associates worldwide. Headquartered outside of Boston, Staples operates throughout North and South America, Europe, Asia, Australia and New Zealand. Our three business segments are made up of: North American Stores & Online, North American Commercial and International Operations. We make it easy for consumers and businesses to shop when and how they want, with more than 1,600 stores in North America, our Web sites and even a mobile app. It’s our vision to provide every product businesses need to succeed, from traditional office supplies and technology to cleaning and breakroom and more unexpected items. Our Copy & Print locations — both stand-alone and in every Staples® store — offer custom-print services, including everything from presentations and business cards to banners and calendars. 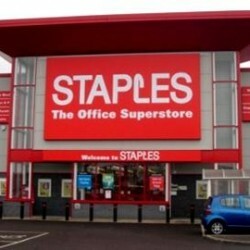 Staples has the world’s largest office products business-to-business delivery operation, serving mid-to-large businesses and Fortune 500 companies. Our North American Commercial business consists of Staples Business Advantage® and Quill.com. Staples Business Advantage®. The Staples Business Advantage one-source solution includes comprehensive products and services from office supplies, technology and printing to promotional products, furniture and facility supplies. Dedicated to providing organizations with greater cost savings and improved ordering efficiencies, Staples Business Advantage provides a customized level of account support and best-in-class customer service. More information is available at StaplesAdvantage.com. Quill.com. Founded in 1956 and headquartered in Lincolnshire, IL, Quill.com serves the needs of over a million small to medium-sized businesses. As a premier business-to-business office products provider, Quill.com sells everything from paper and ink and toner to cleaning supplies and technology with 24-hour-a-day access to more than 65,000 business essentials. Quill.com has been a wholly owned subsidiary of Staples, Inc., since 1998. More information is available at quill.com. Staples is a global company with retail and delivery businesses serving customers in 25 countries. On February 4, 2015, Staples, Inc. (Nasdaq: SPLS) and Office Depot, Inc. (Nasdaq: ODP) announced that the companies have entered into a definitive agreement under which Staples will acquire all of the outstanding shares of Office Depot. Under the terms of the agreement, Office Depot shareholders will receive, for each Office Depot share, $7.25 in cash and 0.2188 of a share in Staples stock at closing. Based on Staples closing share price on February 2, 2015, the last trading day prior to initial media speculation around a possible transaction, the transaction values Office Depot at $11.00 per share. This represents a premium of 44 percent over the closing price of Office Depot shares as of February 2, 2015, and a premium of 65 percent over the 90-day average closing price of Office Depot shares as of February 2, 2015. The transaction values Office Depot at an equity value of $6.3 billion.